Embrace the Montecito Beach lifestyle with your first step into Seaside Cottage. Completed updated and restored in 2008, no detail was left untouched in this romantic escape. The designer furnishings, new kitchen , new bath, and cozy master bedroom all combine to make this the best in Montecito beach living. Authentic antique touches are everywhere; including 1880's stained glass windows, vintage Roycroft 1903 hand made chandelier, and a 1903 electric fireplace with glowing glass embers. The beauty and comfort continue as you walk outside to the creek side sandstone patio area. The river-rock fireplace can be used to warm you on chilly winter nights or just to create a mood for peaceful night time conversation. To the right is the colorful Tuscany inspired lion's-head fountain, crafted on-site by talented artisans. Lounging and dining are easy in the quality hardwood teak furniture. A grand 200 year-old sycamore tree offers partial shade during the heat of the day. There is an herb garden which is flanked by Meyer lemon and Tangelo citrus trees and which provides rosemary, thyme, chives, and spearmint to be used in the gourmet kitchen. The brand new kitchen boasts a custom cobalt blue Viking range, new Fisher-Paykel refrigerator featuring a fast chilling wine rack, dishwasher, and many other amenities. Fresh cold drinking water is provided by the Everpure micro-filltration system. The surfaces are beautiful; natural maple wood cabinets are contrasted with colorful and detailed tile work. Even doing the dishes is a pleasure while looking over the patio to the creekbed below. The living areas are colorful and comfortable. The bedroom feels like a fine hotel room and if you want to shut out the sunshine in the early morning or for an afternoon siesta, just use the remote control to operate the "Solar powered" shade in the skylight. The new bathroom has a special porcelain, oversized claw-foot tub and all new fixtures. The Living Room and Dining room are well designed and offer plenty of room for lounging and dining. Two of Montecito's best beaches, Miramar and Hammond's, are just a 1/2 block away. Montecito Lower Village is an easy 2 minute drive. Santa Barbara, with its many attractions and beaches, is an easy 10 minute drive. Seaside Cottage is certain to satisfy your need for the perfect beach getaway. 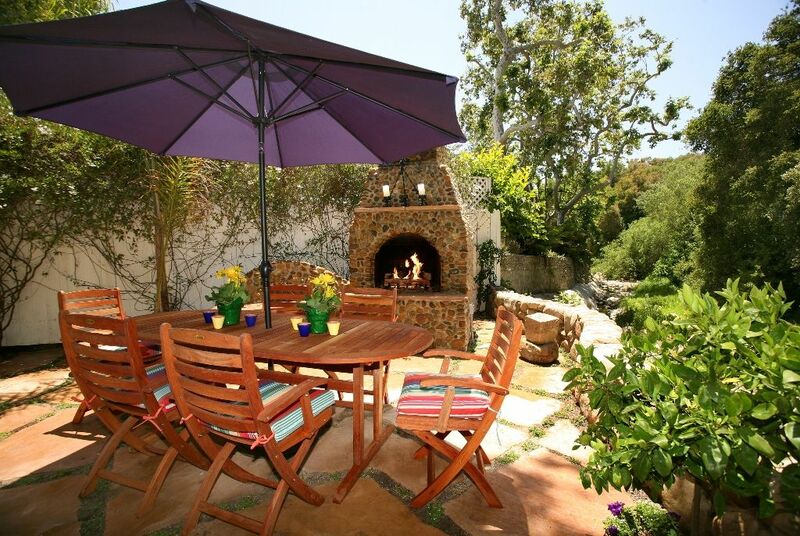 Please consider it for your next Montecito escape. NOTE: This property can be combined with the adjacent cottage (Seashell Cottage) to make a 3 bedroom /2 bathroom home. Access passages can be opened between both living rooms and patios. NOTE: This property is a duplex that shares a wall with our other vacation rental, Seashell Cottage (VRBO #137905). The two cottages can be be combined to make a 3 bedroom, 2 bathroom home and access passages can be opened between both living rooms and patios. This place was terrific. The patio and creek side location are terrific. Loved the birds and train sounds. Easy walk to Mira Mar and Hammond's beaches.My only suggestion would be to provide some smaller vessels in the kitchen. Bowls, cups etc. to too big for our liking. Also the antique iron bed was not to our liking; wobbly and noisy when you move. Charming to look at, but not enjoyable to sleep in. Lovely cottage, well appointed, nice details, skylights, pretty back yard overlooking creek area. Love the location! Sweet neighborhood three min walk to beach. You can hear the train go by, which we actually liked! The house is a duplex, which would be perfect for a larger group; we were alone mostly and it was very quiet, though when the other side was occupied, we could hear the occupants. Property managers were helpful and responsive; communication regarding entry and exit well organized. My wife and I spent the month of Feb. in the Seaside Cottage and really enjoyed the experience. The location is wonderful, as it is a short walk to the beach and very convenient to the Village. We loved Montecito and Santa Barbara. We will be back for sure! This little cottage exceeded our expectations in every way. It is full of charm and so adorable. The location is perfect; the gardens both front and back adorable. So quiet and peaceful. Love the lemon trees! I was here with my two daughters celebrating my birthday and we had so much fun. Thank you! We had a wonderful stay at seaside cottage by Paradise Retreats in Santa Barbara. The beach house is cute with seaside decorating themes throughout, wonderful patio with fireplace and fountain, overlooking a creek. The Cottage is 5 minutes' walk from the beach and another 20 minutes along the beach to Four Seasons hotel Biltmore and Monticeto Village. A great stay to explore the best of Santa Barbara. We also enjoyed the well-equipped kitchen for cooking ! We've stayed at Seaside Cottage before. Love it's decor and charming ambience. All perfect except double bed still has a very squeaky frame!